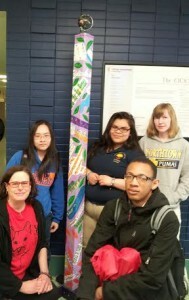 Teacher Jeanette Thompson of CICS Northtown Academy wrote: “Once we knew about the Peace Pole it was somewhat difficult to figure out what we were going to do with it. We took a day to sketch out some ideas on what we will want the Peace Pole to look like. 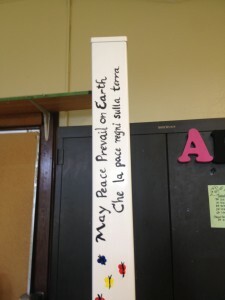 We shared our ideas and our teacher showed us two copies of peace messages in different languages that were provided to her with the Peace Pole. 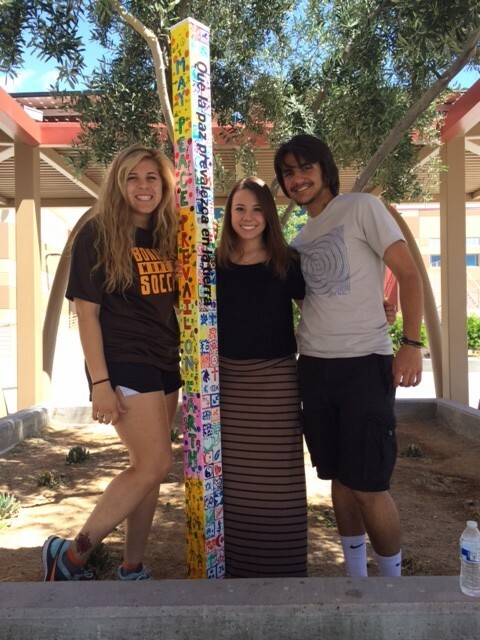 We wanted to included the messages on the Peace Pole; therefore, we asked our Multimedia class to use their tech skills make the messages look more appealing in order for us to put them on the Pole. 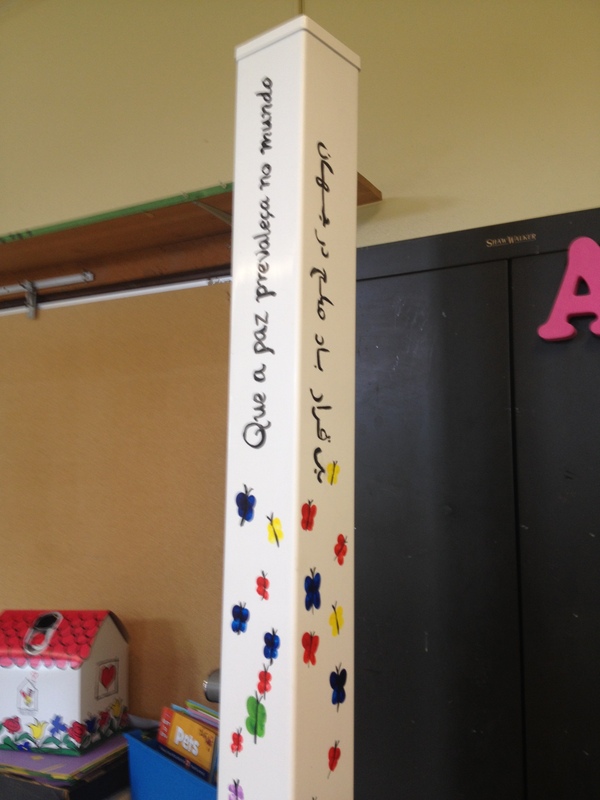 We picked some of the messages, cut them out, and placed them on the Pole with gel medium. 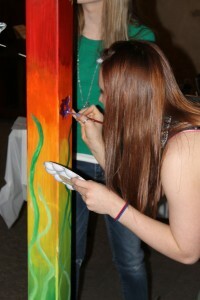 Next we had to choose a color for the background that would represent peace. Our teacher suggested lavender and we agreed. 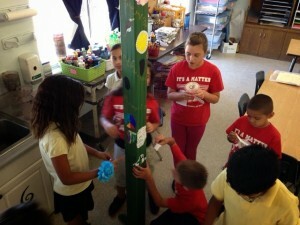 We painted the Peace Pole, taking care to avoid painting over the messages. 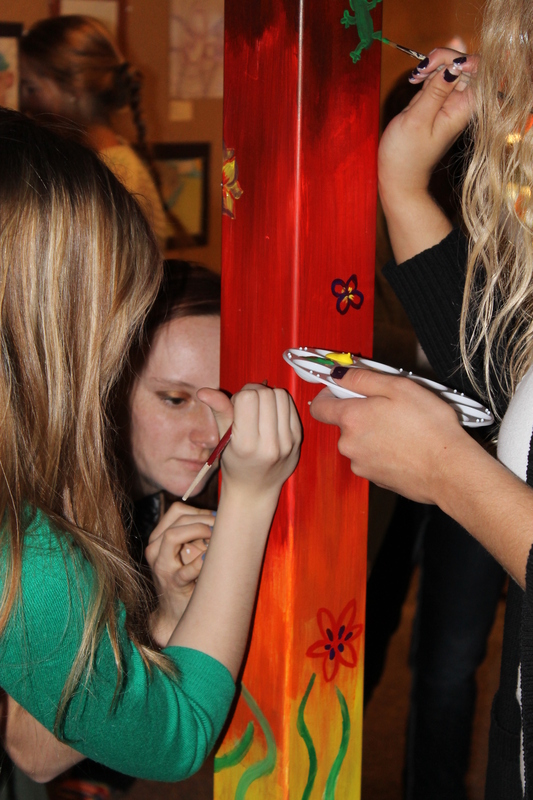 Then we thought it needed something a little more to make it special. 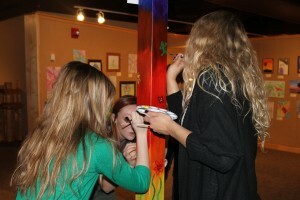 Therefore, we added some silver swirls all over and some green and orange leaves. 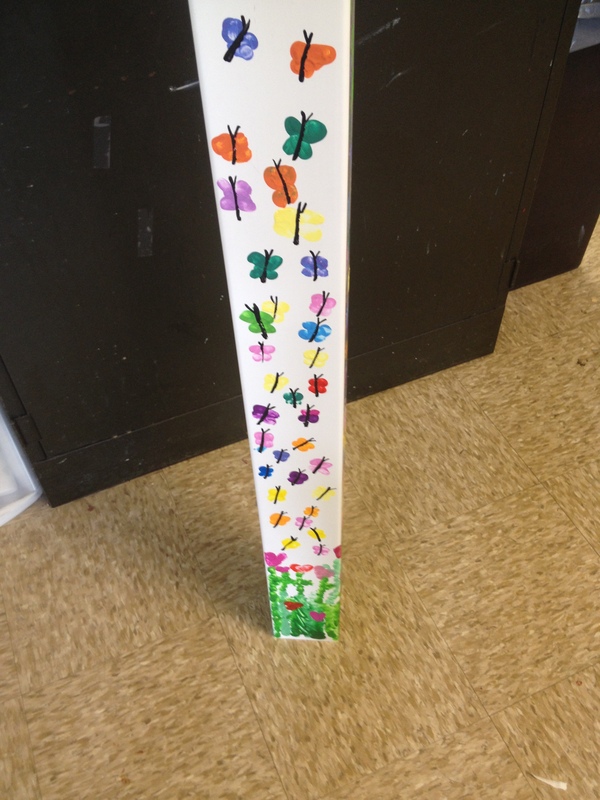 The leaves represent nature and how the leaves change colors over the seasons. 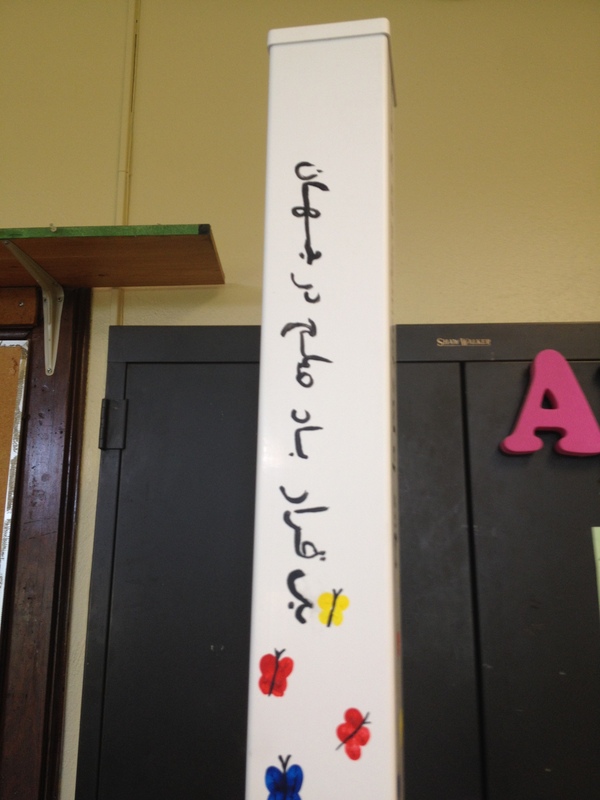 Nature, to us represents peacefulness. Grace Fletcher is the Art Department Chair and Art Club Sponsor at Zionsville High School and her students chose to display the Peace Pole they created during March, which is Youth Art Month, in the Zionsville Community School’s Boardroom in order to draw attention to the art and the subject of the peace. Students covered the Peace Pole in vibrant tissue paper and then attached drawings of subjects that were peaceful to them. 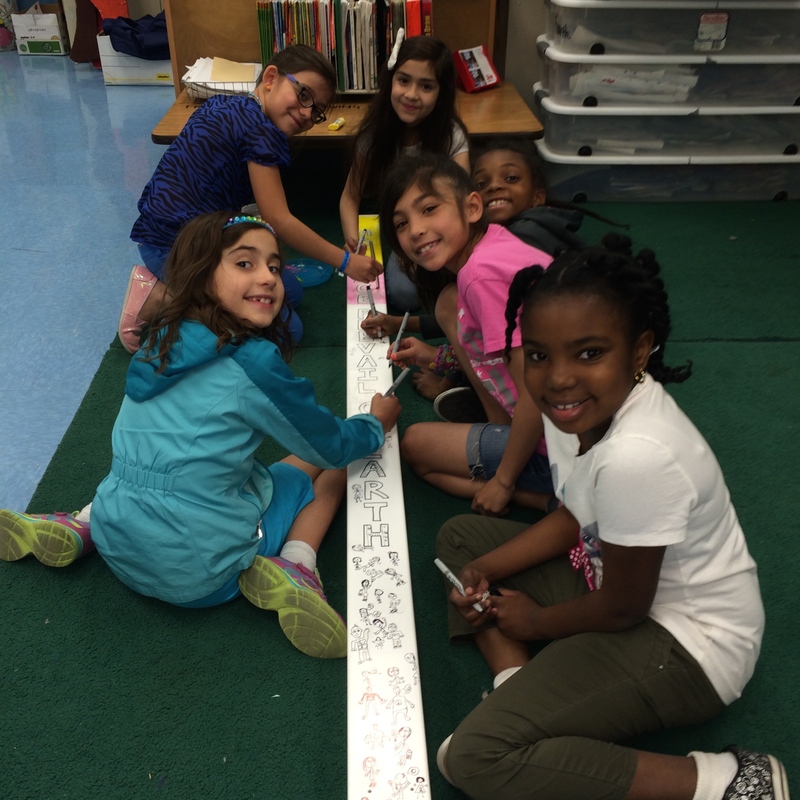 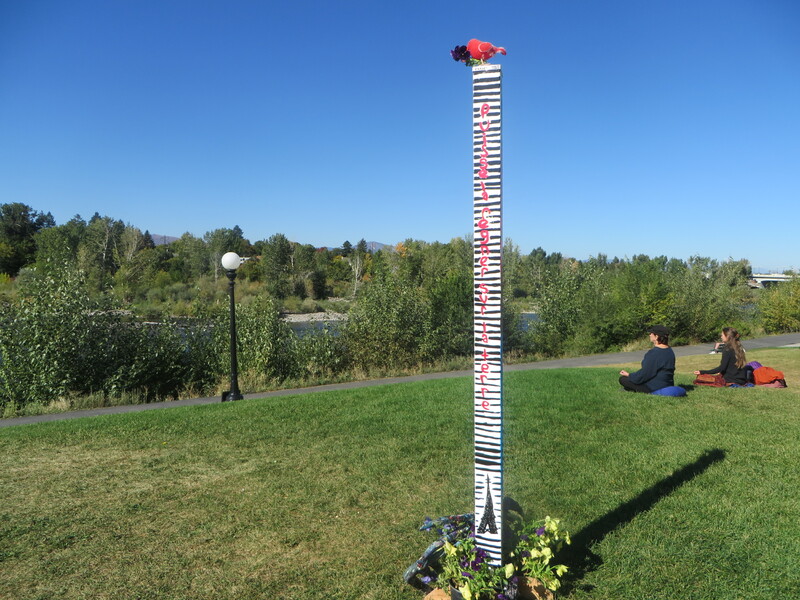 Willard students were proud to create a Peace Pole to share with the Missoula Community on International Peace Day in September. 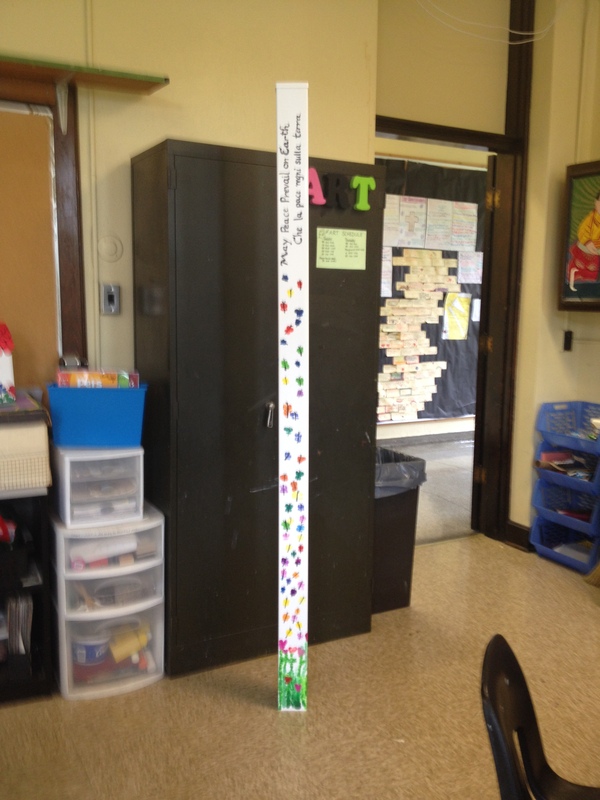 The class chose the following countries to represent: France, Japan, USA, and China. 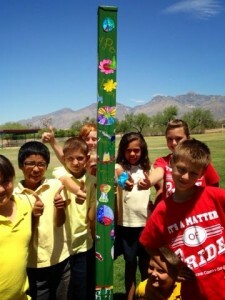 The top of the Peace Pole is a red bird holding a flower for peace. 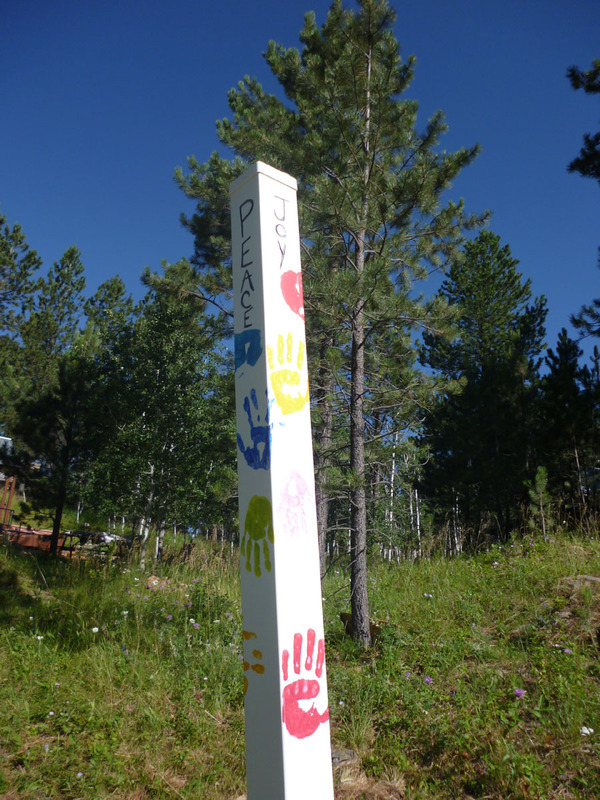 The Peace Pole was the center of a Meditation Hill at Caras Park where Missoulians mediated throughout the day. The Peace Pole now stands in our school and sometimes on the playground that is visited by neighbors. 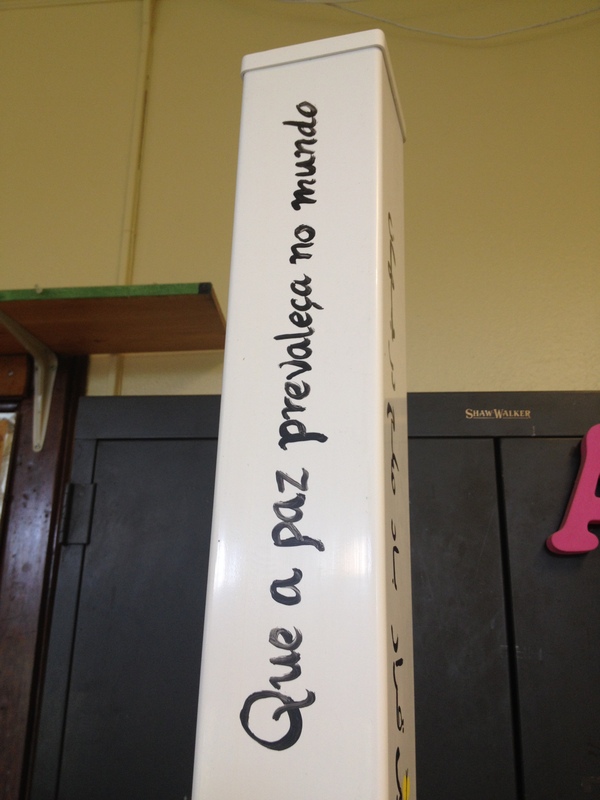 Were were thankful for the opportunity to join other students across the country to celebrate peace. Savannah K. painted the side for France and used the Eiffel Tower to represent France and painted black and white stripes to represent mimes, which she associates with France and considers peaceful, in their quiet expression. 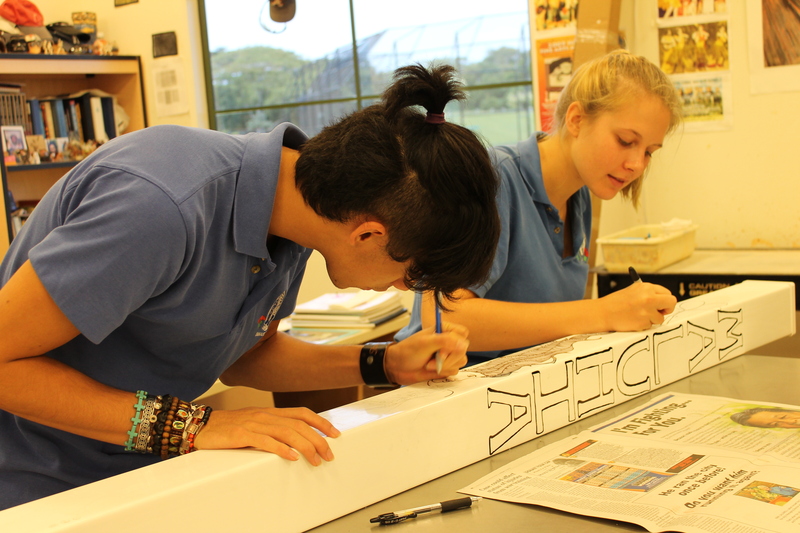 Cody F. and Abby H. were some of the students that worked on the USA side. 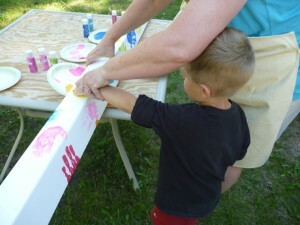 They said that they kept it simple with red, white and blue painted spots, strips and lettering. Sara R. and her group worked on the Japanese side and chose to fill it with the joyful imprints of hands painted with many colors. 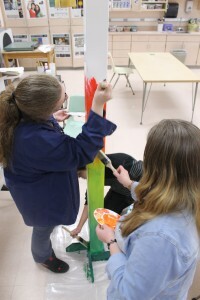 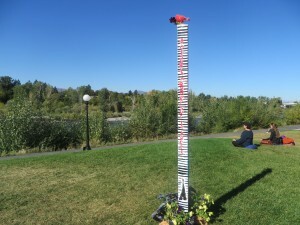 The Youth Art Peace Pole Project deeply thanks Gwen Hoppe, Art Teacher at Willard Alternative High School Program, and all her students who brought the Montana Youth Art Peace Pole to fruition. 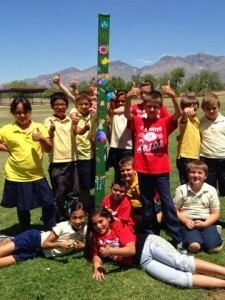 May Peace Prevail in Tucson, Arizona! 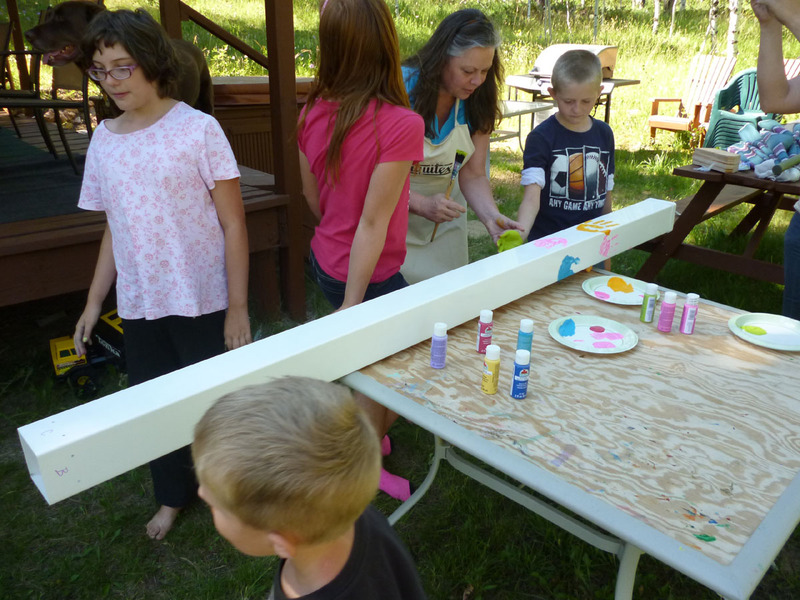 It so happens that the YAPPP was announced to the world at the NAEA National Convention in 2012. 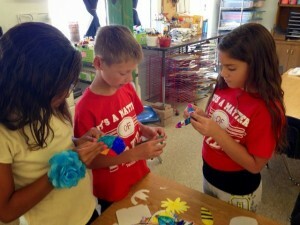 Well, Rebecca Carleton, you and all the youngsters at Randolph Elementary are amazing!!! 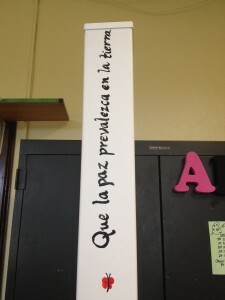 I am quiet inside and silence is peace. 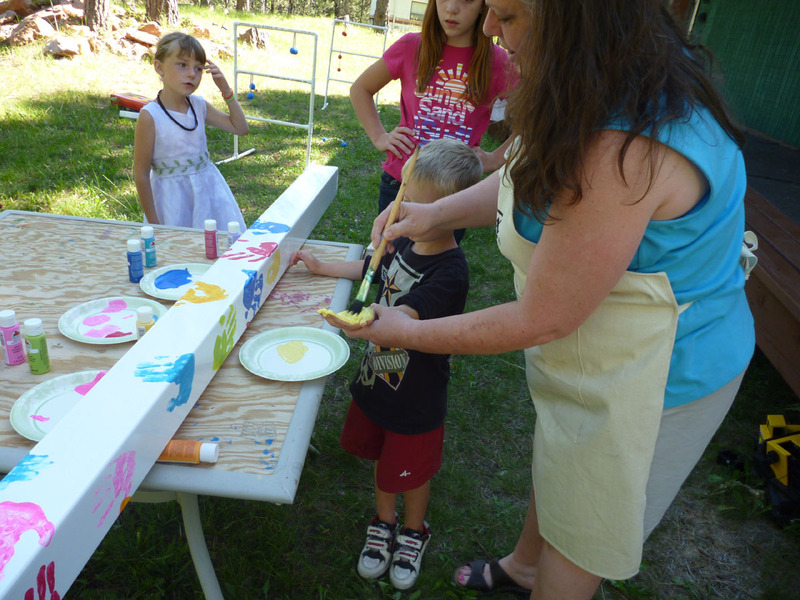 Sitting in the forest late at night we watch the stars. There was silence and peace. 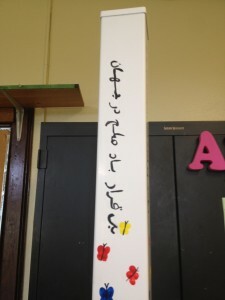 We wait for falling stars. I find peace with friends. 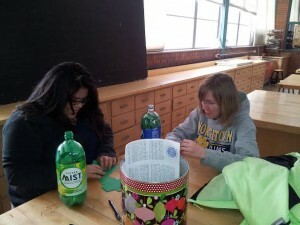 We sit around and talk. 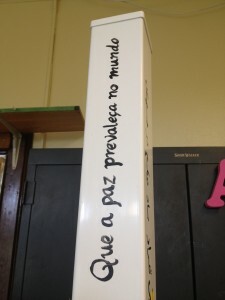 I want everyone to be kind and peaceful, right now, all the time. By Taylor, Grace, Rachel, Tanner and Garret. 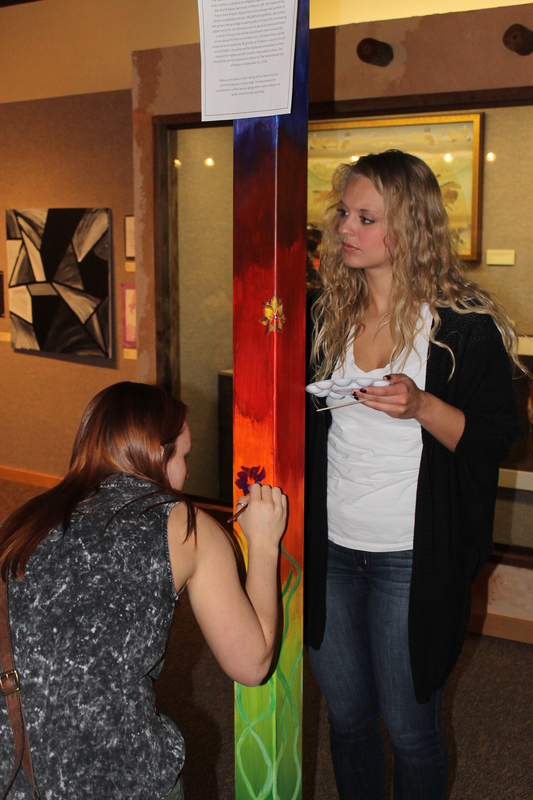 Marcia Shannon’s Art National Honors Society students at Mitchell High School created the South Dakota Youth Art Peace Pole and displayed it at the State Capitol in Pierre, South Dakota on The International Day of Peace. 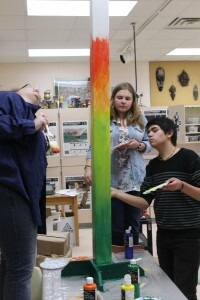 West Career and Technical Academy is lucky to have Lisa Hinricksen, M.A.T. 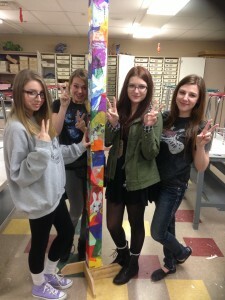 as their Visual Arts Teacher. 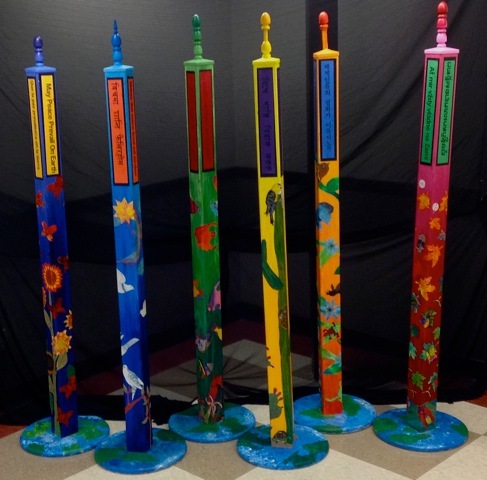 Lisa shared some incredibly great news and also told us: “Our elementary, middle school and high school students LOVED the Peace Pole experience. 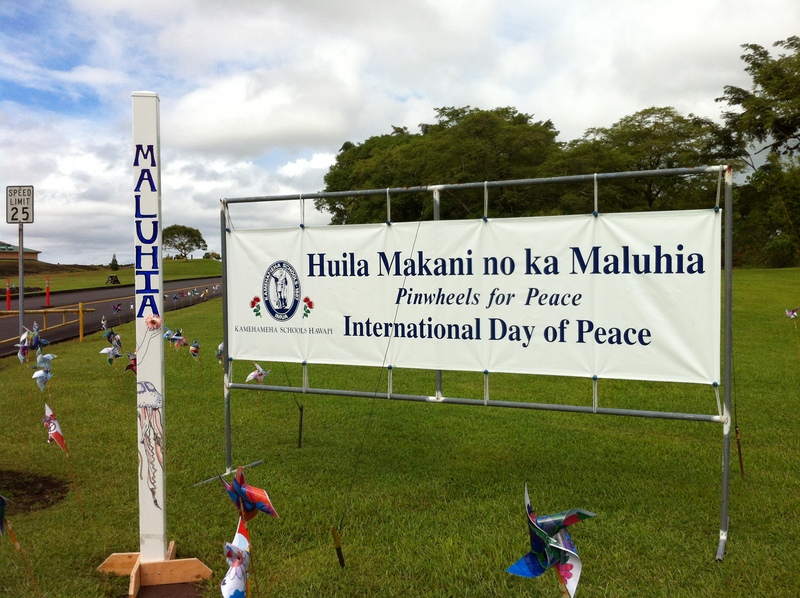 We are now working on Peace Flags and Banners for the ceremony on the 21st. Nothin’ left to do but smile, smile, smile. 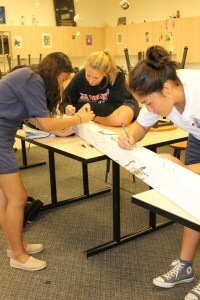 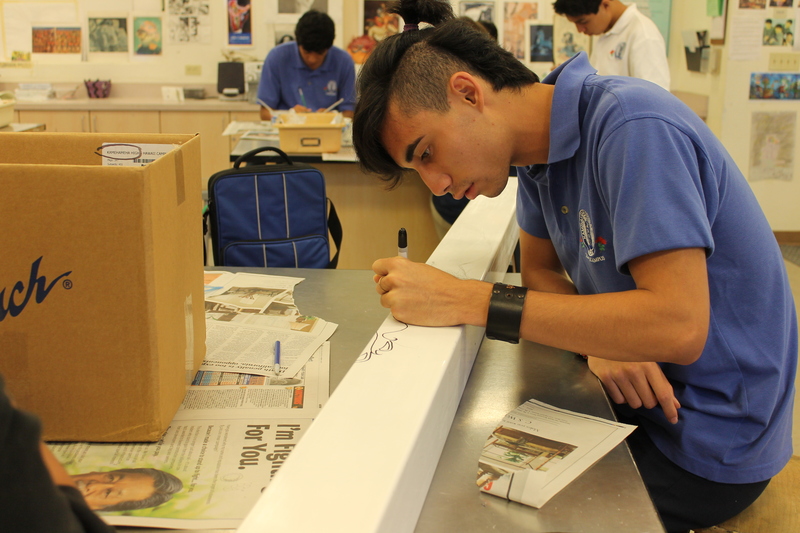 Senior art students at Kamehameha Schools Hawaii High School, under the supervision of Cyndi Bartels, M. Ed. 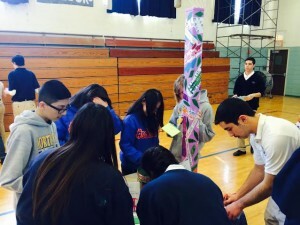 Visual Arts Instructor, created a “Maluhia” (Peace) Pole in conjunction with the elementary students’ “Pinwheels for Peace” project. 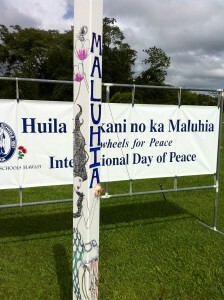 The Peace Pole and pinwheels were displayed for the International Day of Peace on the school’s campus in Keaau, Hawaii. 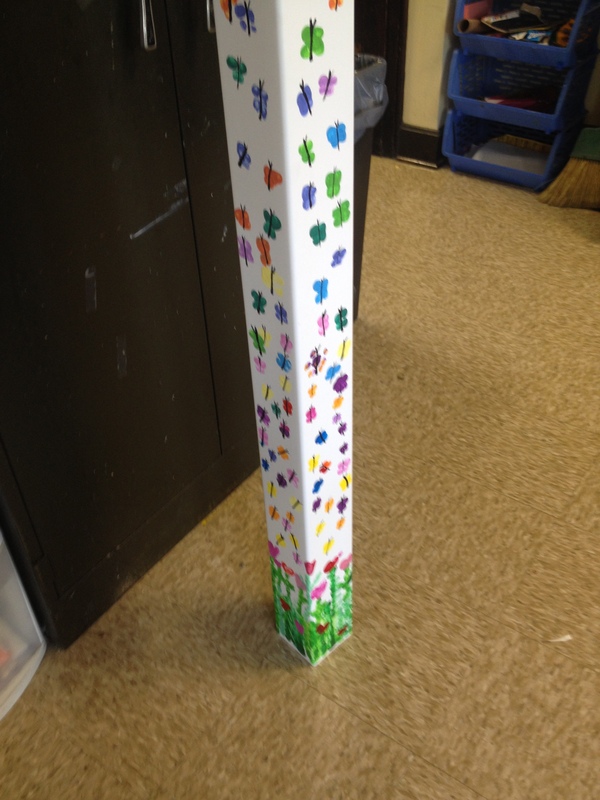 Laura Dant, the Art Teacher at St. Francis of Assisi School emailed the Youth Art Peace Pole Project to say: These pictures are of the Peace Pole created by the students from St. Francis of Assisi Elementary School. St. Francis is located in Louisville, Kentucky. Our school has an enrollment of 243 students. We are ‘A Small School With A Big Heart‘ and this slogan truly does describe our school. 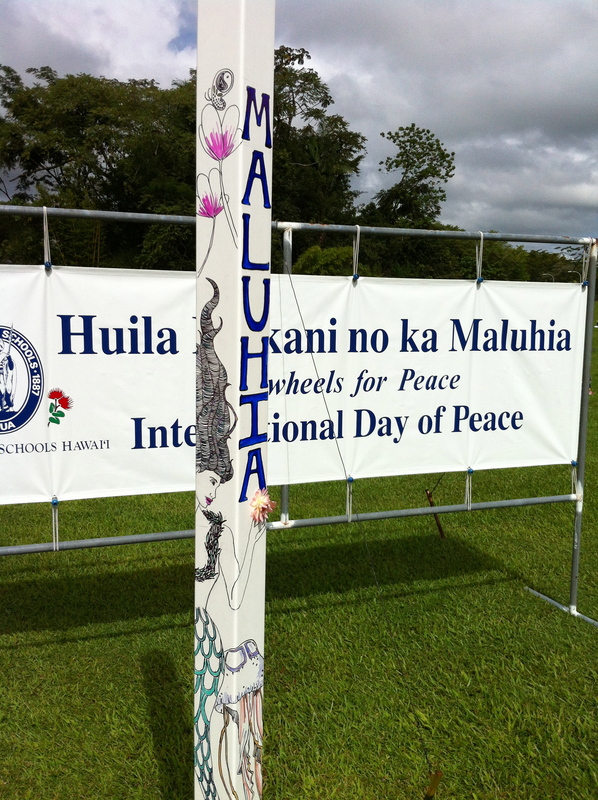 We are a Peace Builders school and all the students participate in a program called HearthPaths. 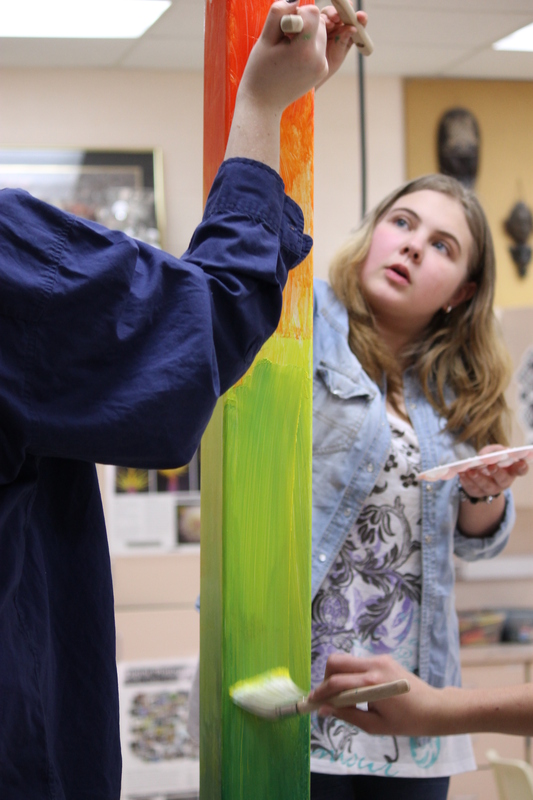 In this program each grade focuses on a different theme for the year and the students learn about that category during the school year (example kindergarten studies animals, 1st grade studies the elderly, 7th — grade death and dying, 8th grade — refugees, etc.) and how to interact with the subjects of their theme in a compassionate manner. 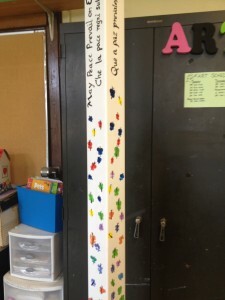 For the Peace Pole, all the students used their thumb print to create our picture. 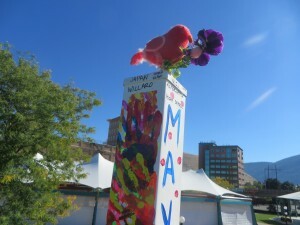 The Peace Pole contains a “garden” at the bottom with blossoming flowers and butterflies. The butterflies symbolize peace and gentleness. 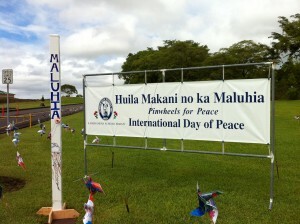 The blooming flowers symbolize being open to accept the responsibility to be a peaceful and gentle person. Our school will display the Peace Pole in our courtyard. We usually have a prayer service and assembly around the International Day of Peace and this upcoming school year this assembly will center around the placing of the Peace Pole in the courtyard.